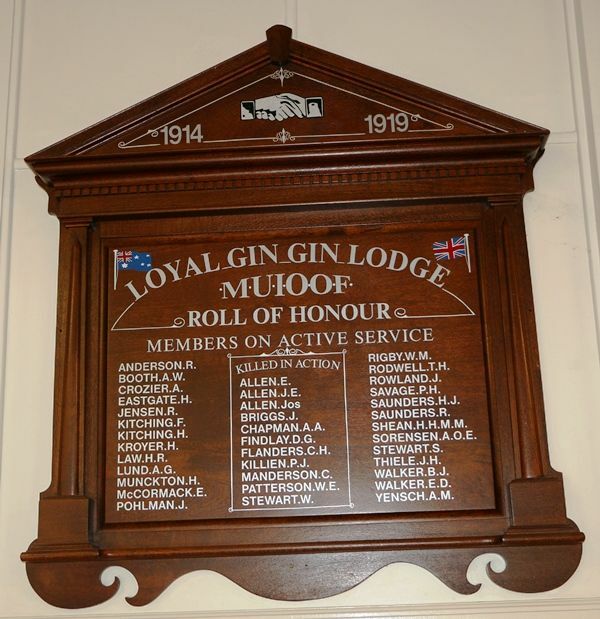 A wooden honour roll commemorates members of the Loyal Gin Gin Lodge who served in World War One. One of the most representative gatherings ever held in Gin Gin was that of the unveiling of the Honor Board in the Oddfellows' Hall, Gin Gin, on Saturday night, the 2nd inst. The Board, which was of silky oak, panelled, was the work of Mr. W. Crow. and lettering was done by Mr. V. Stringer, of Bundaberg, and it was altogether a beautiful piece of work, and the Oddfellows of Gin Gin are to be greatly congratulated for their work in showing their appreciation to those brothers who so willingly offered their services The Honor Board contains 37 brethren names, and also has the Union Jack neatly painted in the right panel corner, and the Australian Emblem in the left corner. The attendance was far above expectations, and among those present were 49 members of the Gin Gin Lodge and visitors being P.G.M. Bros. Juel and Thomas, P.P.G.M Bro. Kerridge, and P.G. Bros. Warrell and Kidd of the Mutual Aid, Bundaberg. The proceedings opened with a social, with Bro Lund at the piano and Bro. C. O. Walker, M.C. At 9.30 o'clock dancing was stopped and N.G. Bro. Saunders introduced P.G.M. Juel to the gathering and requested him to unveil the Honor Board. Bro. Juel congratulated the Lodge on its work, and stated that Gin Gin Lodge stood out as one which had exceeded the average of brothers from their lodge who had gone to the front, and he also regretted that their average of those who did not return was also very high. He stated that over a quarter of a million Oddfellows served at the front, and also explained that in Queensland the members fees from the time they enlisted to the date of their discharge had been paid by the Order. He also explained that they were making provision for returned brothers that were in indifferent health, etc. Bro. Juel then walked towards the Honor board, and with the Oddfellows formed in a half-circle on the floor in front, withdrew the Union Jack aside and thus unveiled the Honor Board. The large assembly then rose and sang the National Anthem. Bundaberg Mail (Qld. ), 8 October 1920.